If you are looking for a work truck that delivers exceptional power and capability come see the Ford F-350 in San Juan Capistrano, CA. This Ford Super Duty truck is available in a variety of body styles with a choice of engine type: 6.2L V8 Gasoline or 6.7L Power Stroke® V8 Turbo Diesel. It cranks out a maximum 450 horsepower and has a maximum towing capacity of 35,000 lbs. (with Gooseneck configuration). Our Ford truck dealership in San Juan Capistrano currently has a selection of new Ford F-350 Super Duty trucks in stock. The F-350 is available with several appearance packages such XTS and FX4 Off Road for a custom look. New Ford F-350 truck trim options include XL, XLT, Lariat, King Ranch®, Platinum and Limited. Explore our inventory of new Ford F-350 trucks for sale to see available models, photos, trim levels, color options, MSRP and dealer special offers. For your convenience, we offer several financing options for buying or leasing a new Ford F-350 truck in San Juan Capistrano, CA. Our team of auto financing experts can help you find the perfect truck at the perfect price with factory incentives or current new Ford Super Duty Truck dealer specials. 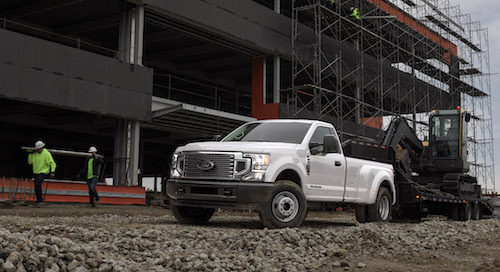 If you are searching for a truck dealership with a wide selection of work trucks offered with affordable prices, we invite you to stop by Capistrano Ford to meet the team and learn more about the Ford F-350 in San Juan Capistrano, California.